In our shop we sell several beautiful cadeusets with Japanese sushi sets, bowls or teacups. Moreover, they are packed in a gift box! 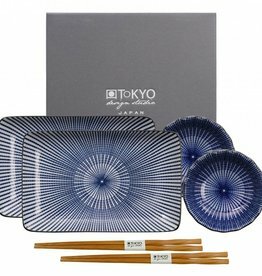 Japanese tableware has a unique design for every occasion there is an appropriate gift. 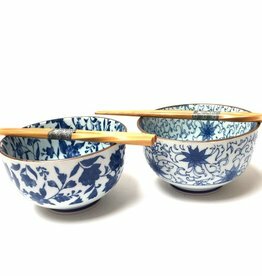 Tokyo Design has a nice gift set Kiku / Shibori bowls. 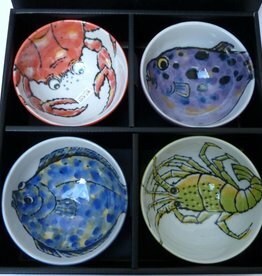 Japanese tableware webshop has an extensive collection of Japanese bowls. Quick delivery. 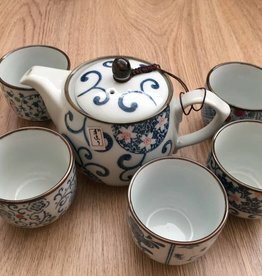 Tea lovers will certainly appreciate this 6-piece tea service! This wonderful Japanese teacups Osaka gift set consists of a set of four teacups, each painted with a unique motif. This beautiful tea cup gift set Sakura from Tokyo Design Studio is a great gift! Tokyo Design Studio has designed these beautiful tea cups with the image of Zen stones in the Japanese garden. They are lovely cups to drink tea or coffee and while enjoying the moment of Zen. These beautiful Japanese bowls are also called Tayobowl and are very suitable for eating out soup or serving other delicacies.